Margaret F. Ross Why are they conflating pizza and milk? Drew C. Pendergrass investigates. When Martin Luther nailed his 95 theses to the door of the All Saints’ Church in Wittenberg, did he know he would be setting in motion an unstoppable cultural engine that could end only in hypertrends like a self-serious storefront that — let’s be clear — exists to sell pizza and ice cream? 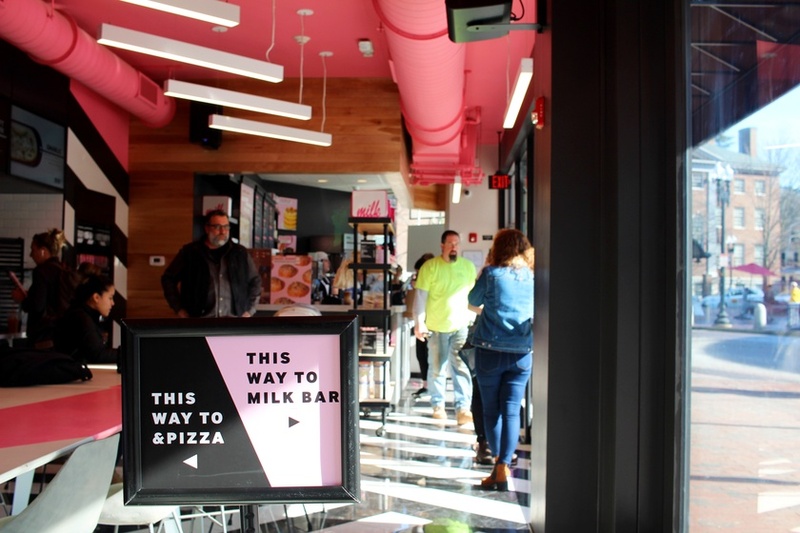 It is impossible to write a review of the Harvard Square opening of &pizza and Milk Bar because the combined &pizza/Milk Bar storefront defies all possible criticism. What is left to say when a personal pizza chain that pays their employees to get ampersand tattoos teams up with a bakery that describes itself as “a dessert empire and lifestyle brand” in an act of unbridled gentrification? If a person who described their personality as a “brand” were a trendy restaurant, they would be &pizza/Milk Bar. If the Hillary Clinton tweet, “How does your student loan debt make you feel? Tell us in 3 emojis or less,” was magically converted into a business, it would be &pizza/Milk Bar. If you could bite into the work-worshipping hashtags #RiseAndGrind or #ThankGodItsMonday, it would taste like a pie from &pizza/Milk Bar (yes, they describe their pizzas as pies). But this feels useless to say, because I am certain that the &pizza/Milk Bar gurus would take this as a compliment. When Martin Luther nailed his 95 theses to the door of the All Saints’ Church in Wittenberg, did he know he would be setting in motion an unstoppable cultural engine that could end only in hypertrends like a self-serious storefront that — let’s be clear — exists to sell pizza and ice cream? Would the frog-like creatures that pulled themselves from the primordial sludge onto the barren land millions of years ago have turned back if they knew that their action was destined to create a “counter-culture pizza brand” that celebrates its “culture of &,” defined helpfully as an “act-unaccordingly” philosophy? Yet all of this pretension is combined in a storefront that reads &pizza Milk Bar, which is both unappetizing and incoherent. Why are they conflating pizza and milk? Is the title a winking acknowledgement that all commodities are the same — that they can just shove words like “pizza” and “milk” together with no heed to consequence or grammar? Nevertheless, my harsh and unforgiving editor demanded &pizza/Milk Bar content on her desk ASAP. So, I braved the cold to go to the 11am opening on Saturday. I even showed up 20 minutes early, but I was still behind several hundred people who cared very strongly about one or both of the &pizza/Milk Bar brands. Everyone was chipper. I had a sick feeling that if I were to sing a song from Hamilton, every person around me would join in enthusiastic unison. Behind me in line, someone complained about how boring Europe is while showing vacation photos to her friends. “Never order takeout paella,” she advised, in case her friends found themselves in a similar situation. A woman in a puffy pink jacket and leather high-heeled boots approached my section of the line, her head crowned in a black beanie that read “milk” in cursive. She asked us what we wanted to try when we made it to the front, and my neighbors gave eager and informed answers of “Cereal Milk™ Soft Serve” and “Crack Pie®” while I looked at my shoes, hoping not to be exposed as a shameful Milk Bar dilettante. You see, Milk Bar is not a simple ice cream store and pastry shop. According to its website, Milk Bar is “known for coloring outside the lines” and employing what they call “an omni-channel approach” — the store is a way of life, not a common calorie trap. The Milk-branded woman began crushing the ice on the sidewalk under the heels of her leather boots. She told us about the series of Milk Bar cookbooks and a Netflix documentary about Christina Tosi, the charismatic founder of Milk Bar. Everyone had seen it except me. After the Milk-branded woman finished her Milk Bar brand pitch, one of my neighbors asked if the store expected such a large turnout on the first day. “Yes,” answered the Milkwoman flatly as she split off another shard of ice with her heels. She turned, almost insulted by the naivety of the question, and walked ten feet further down the line. Tosi was discussed in reverent tones by everyone I met in line. A woman I talked to even did a project on Tosi when she studied pastry-making in culinary school. According to Tosi’s website, she is a “culinary trendsetter and sugar genius” who “approaches life with a whimsically innovative mentality and continues to redefine what american [sic] (dessert) culture is and can be in the ever-changing wild world of food.” Tosi also once made it into the New York Post for advising people to carbonate red wine in their Sodastream to approximate an obscure Italian concoction called lambrusco. The person behind me was still flipping through her vacation photos. “Northern Italian food is really heavy and nauseating to me,” she said helpfully. When I turned around, I saw a lifted black pickup truck covered in salt and dirt parked on Church Street alongside the massive line. “UNLEASH THE BEAST,” shouted the giant window decal. Three representatives of Monster Energy stepped out of the car, covered head to toe in Monster Energy memorabilia. They began handing out bright purple cans, which contained the “Ultra Violet” flavor of Monster Energy Drink. One of the representatives had bright purple hair, which I have to assume was part of the Monster branding strategy. However, at no point did the people who designed this intricate advertising campaign consider that the venn diagram of &pizza/Milk Bar enthusiasts and Monster Energy drinkers depicted two completely separate circles. The ultraviolet Monsters bounced off of the line like it was slathered in sunscreen. I took this complete breakdown of reality as my cue to leave. It had been 45 minutes, and I had traveled less than 50 feet. My feet were so frozen they felt hot. I am sure the food is good. — Magazine writer Drew C. Pendergrass can be reached at drew.pendergrass@thecrimson.com. Follow him on Twitter @pendergrassdrew.